Obama's antitrust chief, Christine Varney, comes from a school of aggressive intervention. Watch for her to focus on technology and big pharma. A veteran of the 1990s' big antitrust litigation, Christine Varney is likely to resurrect the DOJ's active intervention that went fallow during the Bush years. Obama's economic team is pushing through Congress the most expensive emergency spending package in the nation's history. And that's just the start. Do you think the changes being made at Chrysler and General Motors will save the companies? NEW YORK (Fortune) -- Christine Varney has excellent timing. Just two days after the Obama administration's new head of antitrust enforcement announces that she will be a much tougher cop on the beat than her predecessor, the European Union says it is fining Intel $1.45 billion for using its market power to abuse its competitors. But is it luck - or something else? One antitrust lawyer believes Varney knew exactly what she was doing. Jane Willis, of Boston firm Ropes & Gray, notes that when Varney spoke Tuesday to the U.S. Chamber of Commerce, she made remarks about cooperating with international authorities. "I believe that greater coordination with the FTC and foreign antitrust authorities is in the best interests of America's business community and consumers," Varney told the Chamber. "In this light, it appears that Varney's announcement was designed to precede the European Commission's announcement," says Willis. "It's important not to overlook the international audience. Varney's announcement may have been targeted, in part, to signal to her European counterparts that their enforcement priorities will be more aligned." Of the many ways that Obama has distanced his administration from George W. Bush's, one was certain to be in the antitrust arena. Carl Shapiro, who is now the Justice Department's chief antitrust economist, co-authored a paper last year estimating that nearly 30 mergers that would've been challenged in previous administrations were not - like Whirlpool (WHR, Fortune 500) and Maytag, and Sirius (SIRI) and XM. But enforcement has been especially lax, in many antitrust lawyers' eyes, in the area of monopolistic practices, defined by what's known as Section Two of the Sherman Antitrust Act. A Justice Department memo put out last year, which Varney has officially scrapped, laid out very specific, very narrow instances of abusive monopoly practices. "The Bush administration's perspective was that you could do more harm by trying to prevent monopolies than good," says Jeffrey Kessler of law firm Dewey & LeBoeuf. That's at odds with the trend in Europe, where the European Commission has been getting tougher on dominant market share: Companies like Intel (INTC, Fortune 500) and Coca-Cola (KO, Fortune 500) have been charged with anticompetitive behavior. But the Justice Department hasn't brought cases against them in the U.S. Microsoft (MSFT, Fortune 500) and the credit-card networks, Visa (V, Fortune 500) and MasterCard (MA, Fortune 500), settled with the U.S. early in Bush's first term, after investigations launched by Bill Clinton, but Europe has since continued to pursue them in new areas. So Christine Varney is, to some degree, European-izing U.S. antitrust enforcement. "The big gulf will become a smaller gulf," says Daniel Wall, a San Francisco-based lawyer for Latham & Watkins. "We're not going to have the disequilibrium we've had for the past few years, that companies ran to Brussels whenever they had a complaint about a competitor." Varney is a veteran of the big antitrust litigation of the 1990s. 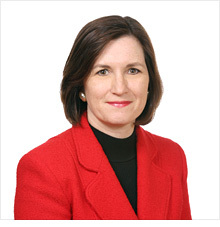 As the head of the technology practice at law firm Hogan & Hartson, the same firm where Supreme Court chief justice John Roberts worked, she represented Netscape during the time that Microsoft was fighting the Clinton administration's charge that its bundling of browser software represented unfair competition. As a member of Clinton's Federal Trade Commission, she was outspoken about monopolies in innovation markets, like drug research, and about the possibility that vertical mergers, where one firm acquires companies in its supply chain, could also create unfair barriers to entry. In part, her attitudes toward market entry reflect a schism in the economics literature. The more orthodox definition of a monopolistic practice, used by the Bush administration, is that by charging below-market prices a company could drive its competitors out of business and then raise prices. So long as new businesses could enter the market, there is no possibility of monopoly. But newer, more behavioral-oriented theories suggest that cutting prices just to later raise them isn't the only way a monopoly conducts itself. By cutting prices, monopolies can show how tough they are, effectively discouraging future competitors without actually raising any formal barriers or directly profiting from its pricing power. "The Bush administration was optimistic that the natural competitive impulses of the market would take care of potential abuses," explains Lawrence J. White, a professor of economics at the NYU Stern School of Business. "Whereas there is greater skepticism in the Obama administration and thus a greater inclination toward intervention." One of the less formal ways that companies stifle competition, Varney argued while at the FTC, is by discouraging competitors' research and development in what she calls "innovation markets." In the same way that low prices can push away competitors from entering the market, if a dominant player begins to research something, it may discourage others from doing so. Discouragement could come in the form of one firm hiring all the top researchers in the field. Or, if the firm already has a giant research arm, new discoveries might be cheaper, and it could price any resulting products in a way that discourages competition. The FTC used innovation-markets analysis to force Novartis (NVS), when it was created by a merger in 1996, to divest its gene-therapy research arm because it would be too dominant. It also initiated an investigation of the merger of Novazyme and Genzyme (GENZ) in the late '90, but the Bush administration quashed it in 2001. Though the Justice Department and FTC are independent from each other, Varney promises to work closely with the new head of the FTC, which could spell the return of innovation analysis. The boom in recent mega-pharma mergers, like Pfizer (PFE, Fortune 500) and Wyeth (WYE, Fortune 500) and Merck (MRK, Fortune 500) and Schering Plough (SGP, Fortune 500), provides plenty of places to start looking. "I would certainly be on the lookout if I had a dominant drug," says Wall. "Health care will be a big priority, because it dovetails with controlling costs." Now that she's at the Justice Department, which traditionally takes cases in the technology space, Varney could bring innovation markets analysis to bear on the likes of Google, too, which many believe is too dominant in search. "You could have a similar concept in technology," says Leslie Overton, of law firm Jones Day. "No matter what industry, the question is how are the incentives to innovate likely to be affected." Prognosticators, however, aren't certain whether she'll actually choose to go after Google (GOOG, Fortune 500), or any of the companies that Europe has targeted. "Everybody talks about Google, but I'm skeptical that's as much as on the minds of the Justice Department as people make it out to be," says Wall. "I don't think this administration will go back to the extreme antitrust enforcement policies of the 1970s," says Kessler, referring to an era that culminated in the breakup of the Bell system. "The main difference will be that Varney will have faith in the courts to decide what is a good monopoly and what is a bad one. It'll be on a case-by-case basis, rather than just one set of assumptions like Bush had."